Can hand gestures dramatically improve the quality of a speech? We have all seen great speakers and they use many tools to capture our attention. One key tool is hand gestures. This article is focused on hand movements and not body language. I watched a Toastmasters International video and several speaking “gurus” who lump the two together. My focus is on just the hands. I’m not interested in head movements, shoulders or postures. I’m focused on the things that reside at the end of our arms. I read articles that suggest that when gesturing you should keep the gestures in the “strike zone”, from shoulders to waist high. • we look people in the eye when we talk and our peripheral vision sees the individual from the waist up. • you want to keep gestures above the waist as not to draw attention to the groin region. Like a good pitcher, you need to work the strike zone and need to toss hand gestures in and out of the zone. This will break up the rhythm and keep your gestures interesting and natural. Not using gestures is like a pause in speaking. This allows the audience time to reset, absorb and proceed the next thought. So feel free to drop your hands to your side as this too can impact a speech message. The inner voice in my head echoes the words of a theater producer and experience Toastmasters, “Make the gestures bigger so the people in the back row can see them”. Many articles overlooked how big to make the gestures. My logic, if the room and audience size increase so must your hand gestures. The exception to this rule is if you are being projected on a large screen for the audience to see, then treat the hand gestures like you would in a personal setting. Personally, I like to use hand gestures to illustrate key points in a speech to help sell the message. Politicians are great at using these techniques. Watch this review of President Trumps hand gestures. First, you must write your speech and once you have your speech, look at areas where hand gestures add value and help explain your message. Then practice these gestures until they become second nature. Here is a parody of Hillary Clinton practicing a speech. Vanessa Van Edwards who wrote 20 Hand Gestures You Should Be Using, list examples of hand gestures, but her list is incomplete as there are way more than twenty. In one Toastmasters meeting, you would witness numerous hand gestures, not on the list of twenty. Are these the most popular 20 gestures? No. Like language, there is slang, dialects and different words that have different meanings. This is true with hand gestures. As a kid, I learn to make the okay symbols with my fingers. In doing research for this article, I learned that some people believe the “okay symbol” is associated with the devil representing triple six (666). I never heard of tossing a shoe at somebody until it happened to President George W. Bush, but in other parts of the world, it is a sign of disrespect. I advise if you are speaking to an international audience or in a different country check with locals to ensure your gestures are acceptable in that culture. After all, a hand gesture does communicate a message to the audience. In Garret Gray’s TEDxIIT talk The Truth About Success, he demonstrates fourteen hand gestures in the first 1-minute and 30-seconds. I’ve listed the movements out for you. 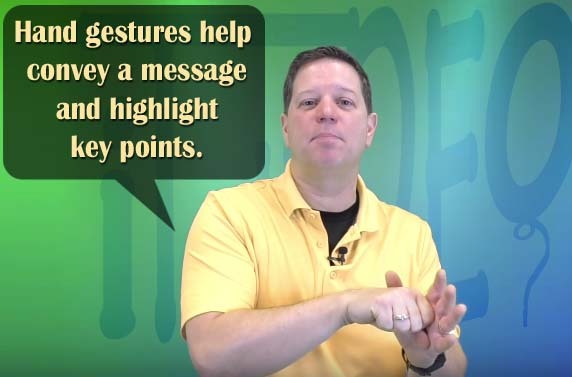 Read through them and then watch the video and see how hand gestures flow with the story and help the audience follow the sequence of events. • Index finger raised representing one. Wikipedia has a large list of hand gestures that people around the word have added, but be warned this list many be flawed. When you are stressing information that you want somebody to remember. Hand gestures are a powerful tool and with some thought, practice, and creativity you can take a normal presentation and make it special. We are given mobility from birth and have been using hand gestures to communicate since that time. It is first when we start to study speaking techniques that we fully understand the power of non-verbal communication. Once you start using hand gestures along with verbal skills, your presentation will improve and communicate better to an audience. Subscribe to this blog or join the tribe and subscribe to iTalkDEO a youtube channel dedicated to helping you communicate better.